Don’t Monkey Around with Standalone Email Marketing. Get Email Marketing, CRM and Marketing Automation in One Powerful App. Send polished email templates, easily segment your contacts and automate follow-up. It’s easy to stay top-of-mind with prospects and customers. Look like a design pro without touching HTML code. 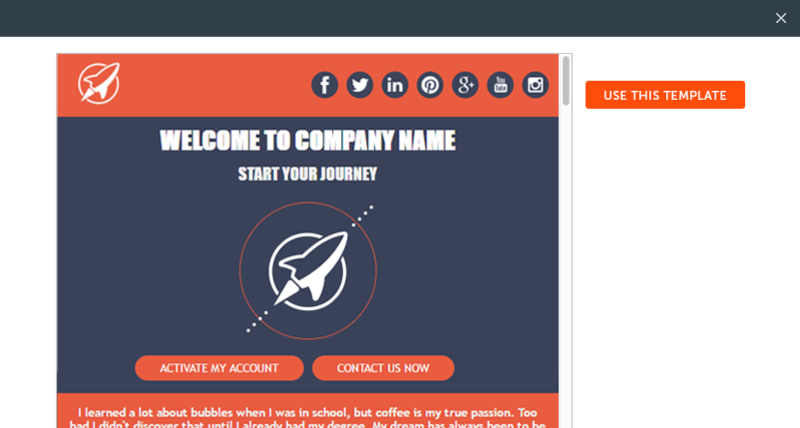 Simply drag and drop your content to create the perfect email template. Want to leave email design to the pros? Grab a pre-designed email template from our expansive library and hit send. Reaching out to contacts is fast and easy. Access your inner email nerd code your own. Or copy and paste templates from another system. Our HTML editor makes it all possible. It’s time to put email marketing and contact management under one roof. Exporting lists from your CRM into Mailchimp? Manually adding email marketing history to your CRM? With Hatchbuck you can track email marketing history, notes and tasks in the same app – saving time, reducing mistakes and eliminating frustration. Email marketing is still the best digital channel for reaching prospects and customers. But, if you’re relying on just a monthly email send, you’re leaving money on the table. Instead, send highly targeted content to your audience at just the right time in their customer journey to squeeze every opportunity out of your sales pipeline. Unlike traditional email marketing platforms, Hatchbuck automates follow-up based on your contacts’ preferences. Dynamically segment your list based on their interests, create tasks, and notify your sales team with hot lead alerts. With marketing automation running in the background, you can focus on what you do best – building relationships with prospects and customers. New to sales and marketing software? We’re here to help. Our live, one-on-one training and ongoing support is free – so you’ll never be left out in the cold. We know that it’s not enough to just learn how to use a new tool – you have to have an overall strategy. We’ll help you to nail down your sales and marketing strategy and put a sales and marketing process in place.